“I have said I would accept the Legislature’s $800 million a year as a big step forward, so long as that number is real. 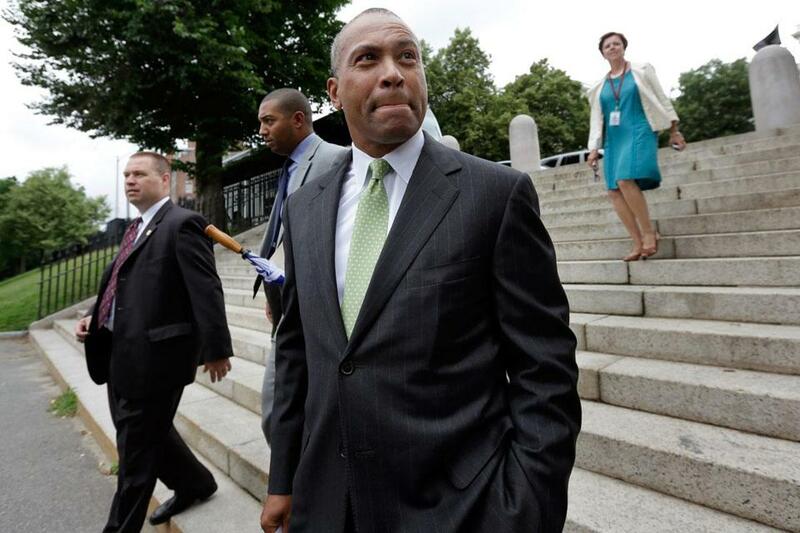 This bill does not achieve that,” Governor Patrick said. Beacon Hill’s long-running showdown over how to fund the state’s transportation system reached a new level on Tuesday, as top lawmakers condemned Governor Deval Patrick’s new plan before he had even finished presenting it. In rejecting the transportation financing measure the Legislature sent him, Patrick countered with a proposal to further increase the gas tax in 2017 if Massachusetts Turnpike tolls expire as scheduled. The governor questioned the wisdom of the Legislature’s decision to incorporate revenue from the Western Pike’s tolls after they are due to be removed, and said any financing package for the state’s ailing infrastructure would be incomplete without a guaranteed source of replacement revenue. “I have said I would accept the Legislature’s $800 million a year as a big step forward, so long as that number is real. This bill does not achieve that,” Patrick said. That proposal drew swift rebukes from Senate President Therese Murray and House Speaker Robert A. DeLeo, who charged the governor with trying to change the terms of the transportation plan at the eleventh hour. The version of the proposal approved last week by the Legislature sets a three-cents-a-gallon increase in the gas tax that goes into effect when the bill becomes law. Beginning in 2015, the gas tax then increases with inflation. Patrick’s plan would increase the tax by at least an additional three cents to help close the $135 million deficit he said would be left if the tolls disappear. The state budget approved by the Legislature on Monday relies in part on revenue contained in the transportation bill, without which the Massachusetts Bay Transportation Authority may impose service cuts and fare hikes. Even as Patrick was briefing reporters on his amendment to the Legislature’s transportation finance bill, Murray and DeLeo rejected his proposal. The bill now returns to the Legislature for a vote, which lawmakers said could occur as early as next week. Patrick’s amendment would receive an up-or-down vote and require a majority to pass. If the House and Senate reject the amendment and return the bill to the governor, Patrick would be presented with the option of signing it, vetoing, or allowing the measure to become law without his signature. If Patrick vetoes the bill, both chambers would require two-thirds majorities to override his veto. DeLeo sounded a note of confidence that he could summon the necessary votes to muscle lawmakers’ wishes over a Patrick veto, which the governor has stopped short of threatening formally. The measure agreed to by the House and Senate received a veto-proof majority. “This threatens working families and businesses still fighting to overcome the financial downturn. Therefore, we will ask our respective chambers to reject the administration’s proposal,” they said in a joint statement. Legislators also contested the notion that the tolls would definitely be removed, saying such a dramatic change in the state’s transportation funding structure is tied to two processes whose outcomes are currently unknowable. And, they pointed out, Patrick’s original transportation financing legislation never addressed changing existing law to affect the tolls’ fate. Lawmakers on Tuesday said the acrimony between Patrick and legislative leaders, particularly DeLeo, over the transportation debate, had again crested. Patrick’s return volley, after the Legislature sent him a modified bill last week, needles lawmakers somewhat for taking a politically risky step of voting for $500 million in new taxes without ensuring that it would fully close the deficit. There is little argument on Beacon Hill that the state is afflicted with a serious transportation financing gap. Patrick said the system needs another $1.2 billion annually, and he called the infrastructure needs outside Greater Boston particularly acute. Patrick shrugged off the tough talk from legislative leaders, and hinted at a public campaign to rally support. “This is just about making sure the bill gets to the actual number that we all wanted to get to,” a senior administration official said Tuesday. By state law, Straus said, the tolls could come down only if two conditions were met: The revenue bonds attached to the Western Turnpike must be paid off, and the state’s transportation chief must certify that the roads are in a state of good repair. A Treasury spokesman said the bonds are scheduled to be paid off in 2017. Jim O’Sullivan can be reached at james.osullivan@globe.com. Follow him on Twitter @josreports. Joshua Miller can be reached atjoshua.miller@globe.com. Follow him on Twitter @jm_bos.